These days, the two most important words in Hollywood are “cinematic universe.” Inspired by the billions of dollars Marvel has made with its Avengers movies, studios have been frantic to jumpstart their own cinematic pyramid schemes with intellectual properties from the Justice League of America to the Universal Monsters to Nickelodeon cartoons. The idea, of course, is to maximize profit by giving audiences movies that spin off characters into their own movies or movies that collect characters from other franchises into massive team-up spectacles. It worked well back in the day when Frankenstein met the Wolf Man and most recently when Captain America fought Iron Man, but it remains to be seen whether or not audiences will sit through “Friar Tuck: Origins” before they see Robin Hood finally get the Merry Men together in the last five minutes of his movie. Above the Army, Air Force, Navy and Marines is an elite military force charged with defending global freedom against terrorist threats from a secret headquarters. Equipped with the most advanced technology available, these colorful commandos hurl themselves headlong into the breach with a devil-may-care attitude. Any child of the 1980s should be able to guess that I’m talking about G.I. Joe, “America’s daring, highly trained special missions unit.” A much, much smaller segment of my generation, however, might eventually get around to guessing that I was talking about MegaForce – after they guessed G.I. Joe, the Bionic Six, the Centurions, M.A.S.K., Chuck Norris’ Karate Kommadoes and the Defenders of the Earth. In just about every way, 1982’s MegaForce seems to contain all the same elements as G.I. Joe, but in live action and splashed across the big screen. Why, then, is G.I. 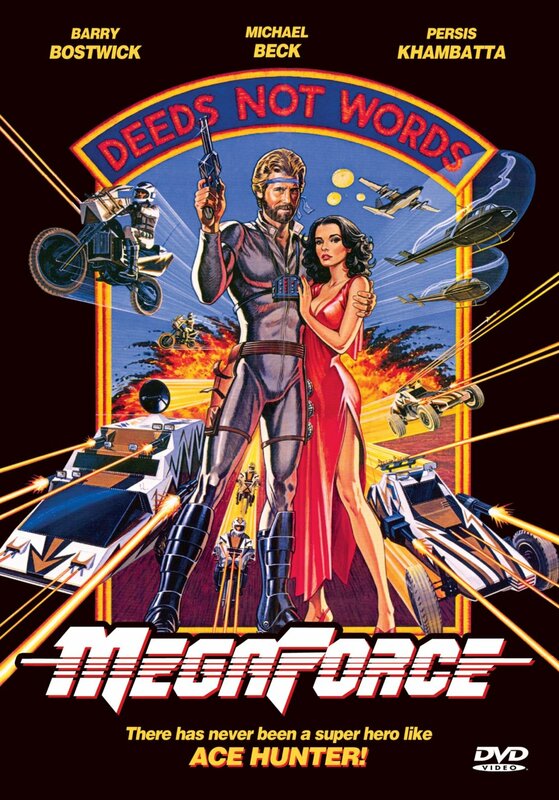 Joe still fondly remembered by those of us with arrested development but MegaForce lives on only in a few scattered YouTube links? Why did the formula that worked so well in one instance fail so miserably in another? Why is there no special edition blu-ray of MegaForce from Shout Factory? The answer is that MegaForce manages the incredible feat of making the idea of an elite paramilitary strike force with sci-fi weapons as dull as bowling on TV.